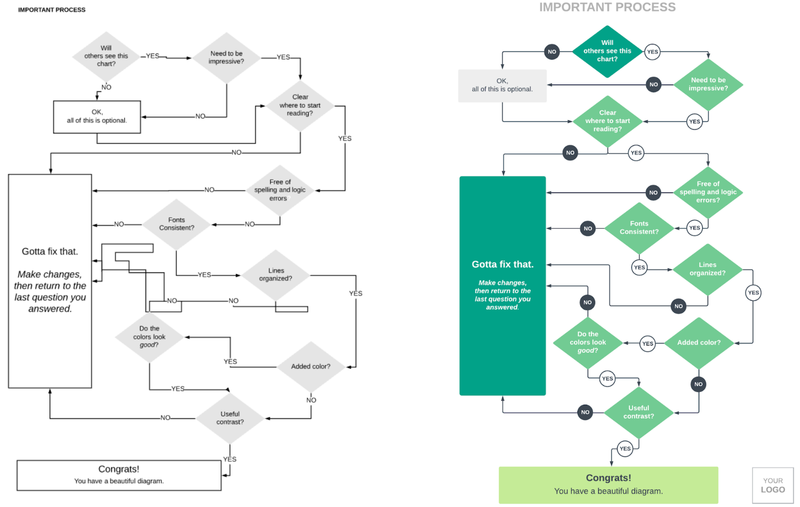 We probably don’t need to convince you that flowcharts are a fast and easy way to communicate complex processes and ideas. But often flowcharts end up sloppy, disorganized, and confusing, so they don’t communicate your message as clearly as you would like. For example, which of these flowcharts looks more appealing? The flowchart on the left could be difficult to follow because it’s monochromatic and the shapes and lines aren’t all aligned. The flowchart on the right uses proper alignment and different colors, font sizes, and shapes to guide you through to the end. Use the five tips below to make your flowcharts clearer and more effective with only a few extra clicks. Lines and arrows guide people through the steps of your flowchart. Make sure each shape is connected to other shapes, and remember the first rule of flowcharts: lines and arrows should move from top to bottom or left to right. Make it clear where the flowchart starts and where it ends. Often, the terminator shape is used to designate the start and end of a flowchart; however, you can use placement (top left for start, bottom right for end), color (green for start, red for end), or size to clearly show where to start and where the process ends. When it comes to color, more is not necessarily better. Try to use three or fewer colors in a single flowchart. You also want to make sure you choose colors that match so your flowchart doesn’t turn into an eyesore. One easy way to find complementary colors is to use a branded image as inspiration. In Lucidchart, you can copy and paste an image onto your diagram, use the eyedropper tool to match colors, and then delete the image once you’re done. Follow along with the YouTube tutorial video below. If you’ll be presenting your flowchart with a projector, avoid gradients, transparencies, and shadows—they may not show up. In standard flowcharts, each shape has a meaning. (See our post on common flowchart symbols and notation!) Even if you don’t follow the exact rules for each shape, using different shapes in your diagram can add additional layers of information and make your flowchart easier to read. Just remember to create a shape key that shows what each shape or color means in your flowchart. Once your flowchart is complete, take a few seconds to align your shapes and lines. An aligned chart looks better and is easier to read. In Lucidchart, you can use the align and arrange buttons to get everything organized in a few simple clicks. Check out the tutorial below! Try to limit the amount of text in each shape. If you need to add more context or details in certain shapes, put that information in a note or comment instead of cluttering the space inside the shape. When needed, add text to lines by double-clicking on the line and adding your text. Not only will these tips help your diagrams look nicer, but they’ll also help others better read and understand what you’re trying to communicate. And when you use Lucidchart, which offers an intuitive drag-and-drop functionality, auto-alignment, and a ton of formatting options, the path to a beautiful flowchart becomes even easier.